The Reunion is an annual event, it's a band, a gathering of friends playing a few jazz numbers in the lounge of the Black Bull public house in Blaydon. If no one turned up it wouldn't matter too much as the musicians on the stand would play for their own pleasure. They come from all parts...Cumbria, Worcestershire, far away Hong Kong and downtown Winlaton - that's the band. 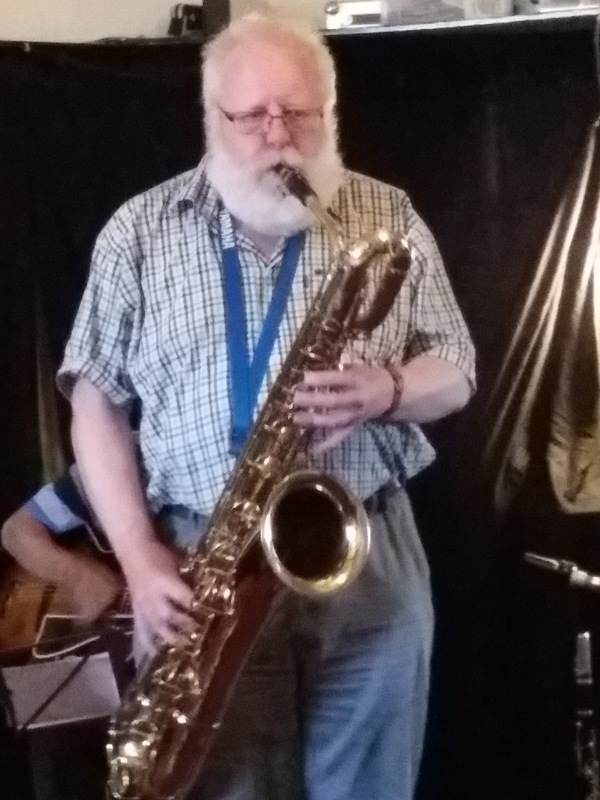 In the main, Blaydon Jazz Club's audience is drawn from the Tyneside area, however, for this annual get together a large contingent of fans make the trip all the way from Hong Kong! 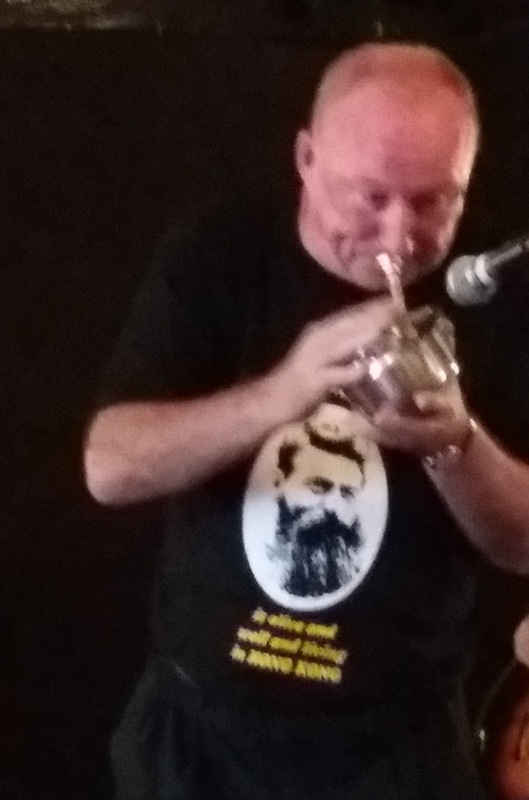 Trumpeter Colin Aitchison, born in North Shields, long-since resident in Hong Kong, returns to Tyneside year after year and a planeload of supporters exchange Ned Kelly's, Kowloon's famous jazz venue, for the equally famous Blaydon Jazz Club. The band's classy Italian clarinettist Franco Valussi, another Hong Kong-based musician, looks forward to renewing acquaintance with fellow reedsman Steve Andrews and the rhythm section boys, eschewing the spotlight - Roly Veitch, guitar, and bassist Roy Cansdale - purr like contented cats. A Train, Fly Me to the Moon (Aitchison's vocal), Moonglow featuring Valussi then Andrews on baritone, Aitchison using not one but two mutes, and a guitar solo from Blaydon Jazz Club's Roly Veitch. A set more small combo swing than New Orleans or Dixieland and a vocal duet - Aitchison and Valussi - on Jeepers Creepers inevitably recalled Louis Armstrong. It isn't every day that Amazing Grace features in the setlist at this, or any other, jazz gig. Last night at the Black Bull the following happened; Colin Aitchison delved into a bag and...out came a teapot. Yep, yer regulation teapot. Amazing Grace blown, bugle-style on a teapot. Aitchison did it, turning various shades of crimson as he upped an octave, coming nicely to the boil, a party piece if ever there was one! 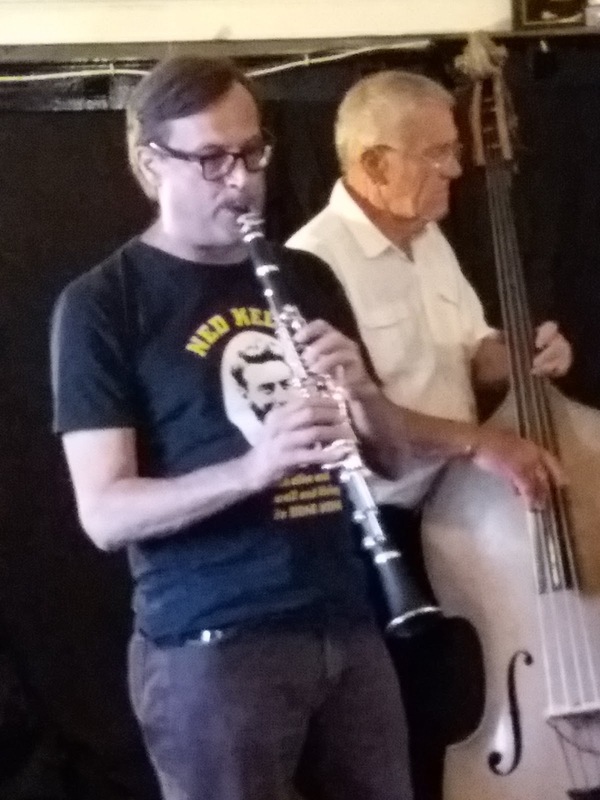 A Benny Goodman feature for Valussi on On the Alamo opened the second set, Aitchison singing A Kiss to Build a Dream On (Valussi and Andrews retiring to the bar), Roly Veitch singing Pennies from Heaven, the high standard maintained throughout. Mr N Sarony returned to ask Do You Know What it Means to Miss New Orleans? following up assertively with Deed I Do. The Reunion was drawing to a close for another year. Johnny Hodges playing the blues appealed to the band and with Sarony once more on the stand to sing Some of These Days that was just about it. All being well, mid-July next year do get along to the Black Bull for a great night's entertainment. Classic Swing @ The Ship, Monkseaton - July 31. CD Review: Chet Baker - Live in London Volume 2. British Jazz Awards 2018. Nominations announced. Burton Agnes Jazz Festival - July 13, 14, 15. Two special gigs on Friday. Breaking News! RIP Nancy Sinatra Sr.
Durham Brass Festival - Remembering Ivy Benson. Francis Tulip Quartet – Tour Dates! Andy Lawrenson Trio @ GCT Jazz Club - July 12. The Mouth of the Tyne Festival - Day 2. July 8. Mavis Staples to play Newcastle’s Boiler Shop! CD Review: Marty Elkins - Fat Daddy. The Cat; The [World] Cup; The [Jazz] Caff. Charlotte Glasson Band @ Jazz Café - June 21.